The picture above shows a cob installed on a roller organ at the home position with the musical scale overlayed on the valves. 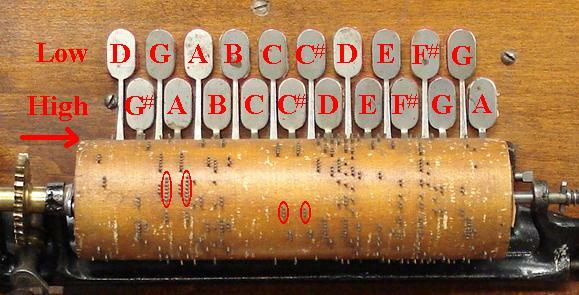 The scale runs from D through G on the top row and continues G# through A on the bottom row. The cob rotates three revolutions to play the tune and advances to the right by one tenth of an inch per revolution. Notice that for most of the scale, the octave notes are side by side, high note on the lower valve to the left of the low note on the upper valve. Because of this arrangement of notes, it is very easy to spot simultaneous octave notes on the cobs. They appear as pin runs starting at the same rotation but separated by three rows (three tenths of an inch). There are many octave notes on this cob and a few are circled for illustration.